The Bishops of Haiti: "A Christmas marked by the great ills affecting our country"
Port au Prince (Agenzia Fides) - After violent protests in the capital and in the city of Cap-Haitien, in the north of the country, Friday 6 and Saturday 7 July, the government of Haiti announced the suspension of a fuel price hike at the beginning of last week. Haiti's Prime Minister Jack Guy Lafontant had motivated the increase by explaining that it would be used to make ends meet, but the administration was forced to cancel the provision. Hundreds of people took to the streets and attacked the Best Western Premiere Hotel, in the exclusive Petion-Ville district of the capital, and after destroying the entrance to the building, they headed for another. According to information gathered by Fides, on Friday 6 July the population unleashed various violent demonstrations against the authorities. 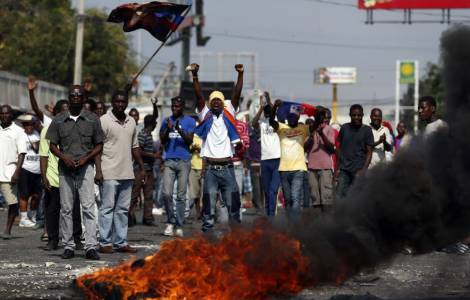 During a clash in the heart of the Haitian capital, a police officer was killed: he was lynched by the angry mob and his body set on fire. On Saturday afternoon, a young man was shot dead near a supermarket by demonstrators, as reported by the AFP. According to the local press, the Haitian president, Jovenel Moïse, asked the population to keep calm: "We corrected what was to be corrected" he said regarding the suspension of the increase in oil prices, announced on Saturday evening.